This White Sheer Ribbon is accented with Red & Blue Metallic Stars & a coordinating fuzzy Red Metallic Wired Edge. 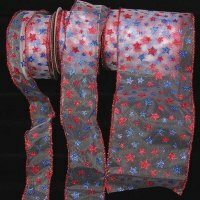 Use this Decorative Ribbon for ideal for decorating, to create crafts, make decorative bows and so much more. Widths: 2", 3" & 6"